What do real historians and experts say? These are real historians who have been criticized for denying the Armenian Genocide mostly by Armenian scholars. However, look at their credibility, look at the many books they've written, look at what places they graduated from and their work in unrelated fields. You will find that these are actually objective historians who have studied the subject--these are people who've actually been to archives around the world. They don't deny the Armenian Genocide because they ignore evidence, they deny it because of the lack of evidence for it. As any scientist would reject a hypothesis without any supporting evidence. To counter their credibility (instead of countering their arguments), some Armenians have claimed that they must have been paid by the Turkish government, except there is no evidence of this, and the same can be said about Armenian scholars being paid by the Armenian government. 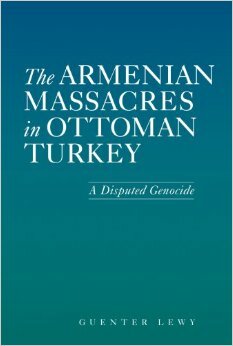 "There is no evidence of a decision to (Armenian) massacre. On the contrary, there is considerable evidence of attempt to prevent it, which were not very successful. Yes there were tremendous massacres, the numbers are very uncertain but a million may well be likely," and that because of this and other significant differences between the Armenian massacres and the Holocaust, parallels are "rather absurd". In 2006 he re-iterated this point, arguing that "the issue is not whether the massacres happened or not, but rather if these massacres were as a result of a deliberate preconceived decision of the Turkish government," and that "there is no evidence for such a decision." "The Blue Book written by Viscount Bryce and Arnold Toynbee has been used as proof that Armenians and the victims of the Jewish Holocaust suffered the same fate in history. This book has been said to be a product of British intelligence designed to promote and promulgate lies during World War I. Britain had set up the war propaganda bureau at Wellington House for the sole purpose of promoting lies and misinformation on Germany and the Ottoman Empire. The British were in full co-operation with American missionaries in Anatolia and the American Embassy in Istanbul conjured a so called Armenian genocide based on gossip, hear-say and erroneous information. The real purpose behind this exercise was to create and strengthen an image in the minds of British military officers that the Turk were evil, horrible and untrustworthy" McCarthy adds. Among other well-known historians who do not name the 1915 civil war a genocide and are against calling these events a genocide are Heath Lowry (Princeton University), Gilles Veinstein (College de France), Stanford Shaw (UCLA), J.C. Hurewitz (Columbia University), Guenter Lewy (University of Massachusetts), Roderic Davison (Central European University), Jeremy Salt (University of Melbourne), Malcolm Yapp (University of London) and Rhoads Murphey (University of Birmingham). On May 19, 1985, a total of 63 scholars from various American universities sent a letter to the U.S. House of representatives opposing the House Joint Resolution 192 which defined the events of 1915 as genocide. Dr. Stanford J. Shaw, the historian who challenged the Armenian claims of genocide at the hands of the late Ottomans and provided evidence of Turkey’s aiding and fostering Jews during WWII, died on Saturday at the age of 76. Shaw was a professor of Turkish history at Bilkent University in Ankara and at UCLA as well as the founder of the International Journal of Middle East Studies, published by the Cambridge University Press for the Middle East Studies Association. Hrant Dink, was strictly against the Armenian bill in the French parliament. Dink had protested the bill and said “I will go to France and say that there is no genocide to protest the bill”.